Met up with some friends from uni the other night. I hadn’t seen Rikard (far left) for about 7 years and I’ve only seen Max a few times since graduation way back in 2000! It was fun catching up. Just like the good old days. Plenty of nachos and beer too! 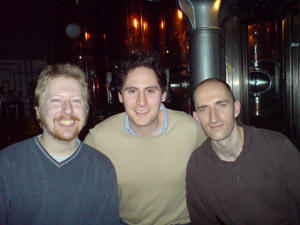 The picture was taken at Bunker bar in Covent Garden. This entry was posted in Zoloft reviews on November 22, 2006 by admin.